At first sight, the important role that a small 15-barrel brewhouse plays for a major global brewer would not be suspected. But as the beer industry’s thirst for new flavors and styles continues to increase, the ability to create and develop new products is more critical than ever. A major global brewer’s increased focus on product and ingredient development placed new demands on their Research Pilot Brewery a small, state-of-the-art facility that provides creative license to their brewmasters to create new recipes, experiment with ingredients, and explore new brewing techniques. More frequent process and recipe modifications were now required for the brewery’s innovative role, but automation changes were difficult to make due to the age and limitations of the existing legacy control system. A new control system would be needed to provide more flexibility for process modifications, enhanced recipe management, expanded use of process data, and better support and system reliability. McEnery Automation followed CSIA industry best practices, investing time early in the project to document the customer’s requirements and expected results, as well as providing advice to avoid potential future limitations and inefficiencies. Our engineers worked closely with the brewery to get a complete understanding of their brewing and CIP processes, and captured them via flow diagrams and description of operation documents. A modern Rockwell Automation platform was implemented, allowing the brewery to meet current goals while providing flexibility and scalability for future needs. The system included ControlLogix controllers, FactoryTalk ViewSE HMI and FactoryTalk Historian. Redundant servers provided increased reliability. FactoryTalk Transaction Manager was used to share recipe and production data with an existing Oracle MES database. An in-chassis ProSoft gateway module allowed the ControlLogix processor to communicate directly with the existing Profibus I/O hardware, allowing all existing wiring to remain in place and reducing the overall project cost and system downtime. 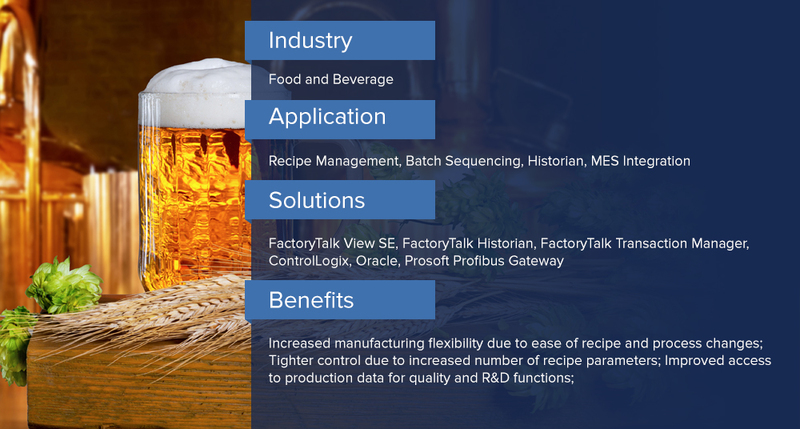 Upgraded recipe management allowed for unlimited master recipes, additional recipe parameters resulted in tighter batch control, and on-the-fly recipe parameter changes increased operational flexibility. Time spent in design reviews and customer simulation and testing paid dividends throughout the project. Overall costs were 20% underbudget. 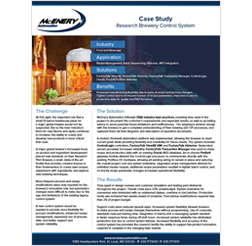 System downtime for conversion was minimized with no unplanned delays, overtime or lost batches. Production mode was achieved two weeks ahead of schedule. Post-startup modifications required less than 2% of project budget. Support costs were reduced several ways. Increased system flexibility allowed brewers to make process and recipe changes themselves without programming. Use of corporate standards reduced training time. Integration of alarms into a messaging system resulted in faster response times during off-shift hours. Increased system reliability has eliminated production lost due to control system failures. Increased flexibility and accuracy of the control system has provided the research facility the ability to support the product innovation required to compete in the changing beer market.